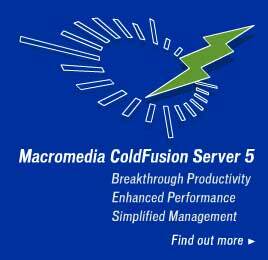 San Francisco, California —June 11, 2001—Macromedia, Inc. (NASDAQ: MACR) today announced the availability of Macromedia ColdFusion Server 5, the latest version of the industry-leading Web application server. ColdFusion Server 5 is available immediately for purchase directly from Macromedia or from distributors and resellers worldwide (see below for details). A free 30-day evaluation version is also available for download via http://www.macromedia.com/software/coldfusion/resources/. "ColdFusion Server 5 provides the most approachable and cost-effective solution for creating interactive user experiences on the Web," said Adam Berrey, vice president, ColdFusion business, Macromedia. "By focusing on the key developer requirements – increased productivity, simplified management, and enhanced performance – ColdFusion 5 enables customers and partners to build and deliver the next generation of Web applications." Macromedia ColdFusion 5 empowers Web developers with a highly productive solution for Web development, deployment and management. Customers such as Johns Hopkins University, Hasbro, Inc., the Smithsonian Museum of Natural History, Binney & Smith – creators of Crayola, RemoteSite.com, Eastern Carolina University, CHUM.FM and Flare Networks have already successfully deployed production sites with ColdFusion Server 5.